OPI recently released their Skyfall collection in celebration of the newest James Bond film (called Skyfall) and 50 years of 007. The collection includes 12 shades of which I have my eye on around 7 of them and following the OPI tradition they have so awesome Bond inspired names. The Skyfall collection also includes 3 magnetic polishes and very special top coat. The Man With The Golden Gun is a top coat with real 18K flakes of gold within it. AMAZING! As soon as I heard of it I knew I would own it. So when it came into stock on AdoreBeauty last Friday the debit card was out of my purse quicker than you could say 'Bond, James Bond'. It comes packaged in a black box that makes it feel very limited edition. The actual bottle is gold. I LOVE. 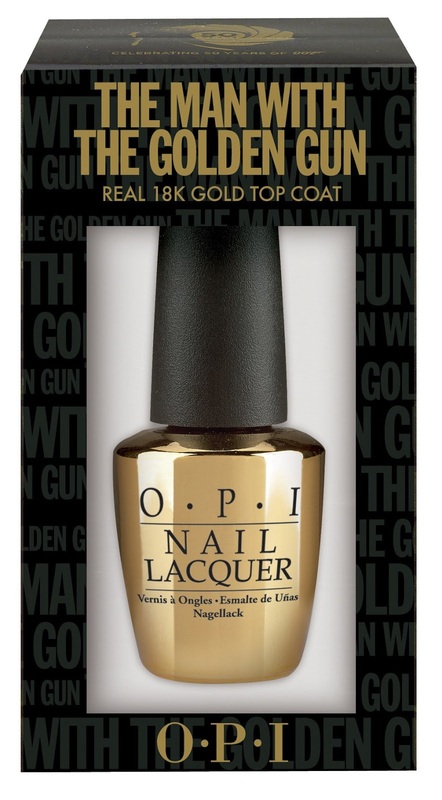 It is the standard 15ml size of OPI polishes. I decided to layer it over a kit Cosmetics polish. It is a mini from the Futuristic Fever set. It doesn't appear to actually have a shade name. It is a pretty metallic fuchsia. Firstly I applied two coats of the kit polish and let to dry. I then applied two coats of The Man With The Golden Gun top coat. You could apply more for a stronger effect. The top coat was a little difficult to apply. As you stroke the brush down the nail, the small gold flakes seem to end up more at the tips of the nail. It took a slight adjustment to how I paint my nails to get the right result. It needs to be dabbed on instead on stroked (if that makes sense...). I absolutely love this polish and am seriously considering buying a second as a back up. I am looking forward to experimenting with this over different colour bases. I think it would look great over a turquoise. It is available now at AdoreBeauty and retails for $39.95 - run, don't walk! Love it that fuschia and gold combo looks fantastic.